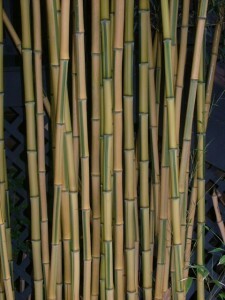 We do more than just bamboo! I have some experience with design and have been in a lot of yards. So for simple projects where you just want to add a few plants to screen or raised beds for vegetables I have some ideas. For larger designs and more complex projects I work with designers. 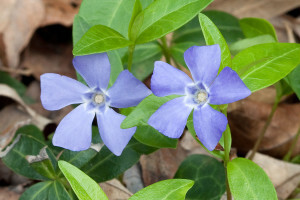 Vinca minor forms a dense spreading carpet which can grow under and amidst canes. 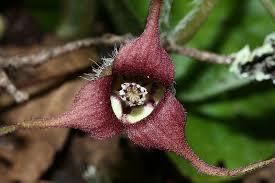 Asarum caudatum is a northwest native ginger which forms a dense spreading mass, best planted under larger bamboo which provides shade. 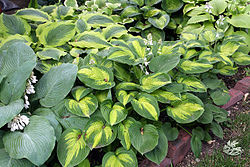 Hostas of all kinds have large leaves which contrast with the slender leaves and vertical canes. Other contrasting plants with large glossy leaves such as evergreen magnolia and Fatsia japonica look good next to bamboo. 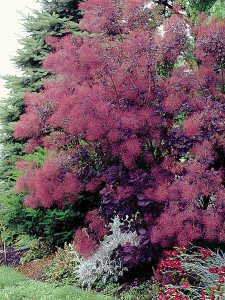 The intense colors of a purple smokebush, Cotinus coggygria looks striking against the yellow canes of Phyllostachys aureosulcata “Spectabilis”. All kinds of coniferous evergreens provide complimentary color and texture with bamboo like Hinoki cypress, junipers and pines.